Good for You-Naturally!™ for Life is a very affordable online Course to help you transition to a lifestyle of eating for better health (and weight loss too) for your family—for Life! This Course will guide you by Freedom & Simplicity™ through 7 Steps toward developing eating habits for better health. Each week you will work on one small step, where the focus is on adding a variety of Good for You-Naturally!™ foods, rather than depriving yourself of everything you like, as most eating plans do. There are most likely many things that you do need to eliminate from your diet, but more importantly we want to help you form habits of eating things that are Good for You-Naturally!™ These habits will help you turn naturally to a good choice, when you are “hungry” rather than your old bad-for-you choices. Before you can eliminate the bad, you have to have an alternative, something Good for You, to fill the void. This Course is offered to help you learn not only what those Good for You-Naturally!™ choices are, but also why they are important, and how to begin and make them habits in your life! 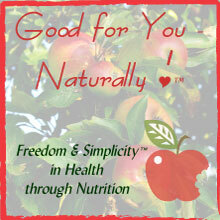 This course focuses on transitioning to Good for You-Naturally!™ foods. It includes step-by-step guidance, and practical help, including recipes, shopping tips and food preparation instruction. Along with this course you also receive the Good for You-Naturally!™ Seminar audios (as downloadable files,) as the information in them is foundational to this course. In addition, you’ll receive many recipes from the Good for You-Naturally!™ recipe books. These additions makes this course an exceptional value! This course has 8 weekly steps to take, but it is really a ONE YEAR MEMBERSHIP! You will have access to this course for one year, allowing to progress at your own rate (or revisit as necessary.) Various medium will be used to present this course – written documents, audio, assignments and journal questions (for your own benefit – not to be turned in.) Chats and Q&A Forums also allow interaction with the instructor and other students. 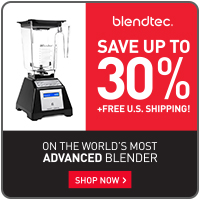 Get it all for just $49.95 New Reduced Price $39.95! The foods focused on in this course are foods that are Good for You-Naturally!™, those given as God’s Original Diet for man, that is, raw fruits, raw vegetables, raw nuts, and raw seeds. 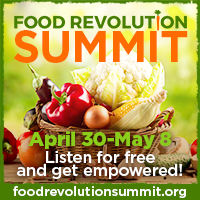 If you are not interested in learning how to transition toward those types of real foods, from the S.A.D. Standard American Diet, to improve your health, weight and life, then this course is not for you. But our emphasis is not on converting you to a 100% raw food vegan diet. (We don’t even follow that.) We just want you to begin to take steps on the path toward a lifestyle of eating for good health, including more of those foods in your diet, and easing the SAD foods out. If you’d like to know more before enrolling, check out our FREE Preview to this course, Good for You-Naturally!™ for Life FREE Preview. It is a 2 week course introducing you to the ideas that will be expanded on in this course. You will need to Create a Free Account to log in to our course site first. *The 1 year membership is provisional to no technical difficulties that are out of our hands and un-fixable. If the course should crash during the 8 active weeks, another method will be found to deliver content.